Real time satellite tracking. 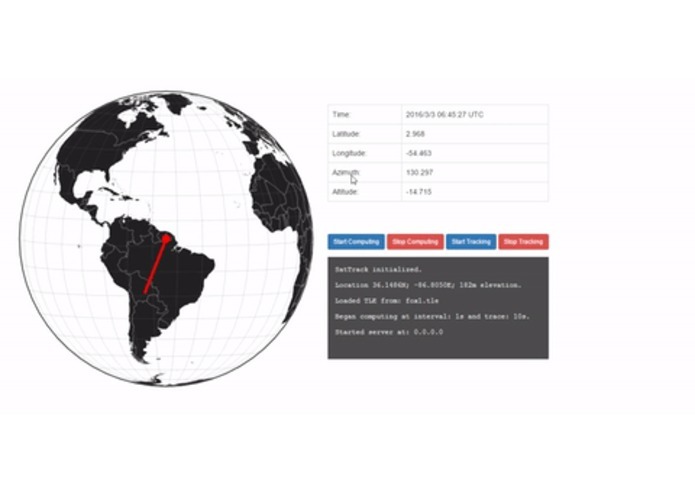 Sattrack is a simple portable application that lets you predict, visualize, and track satellite passes from your smartphone or the command line. Record transmissions at a particular frequency using RTL SDR. For illustration the sandbox.py and trial.py which contain basic uses of the SatTrack class. The GUI simplifies controls by requiring less arguments. The values put in defaults.py are used for all satellite instances created. This starts a local server on localhost:8000 and also broadcasts it over the device's network. You can open up the interface by typing localhost:8000 on your local browser. Or you can access the interface from any web browser on another device by going to <HOST_IP_ADDRESS>:8000 e.g 192.168.42.1:8000. For connecting servos etc. see Set up and Wiring in the next section. s.load_tle('file_location')     # OR Load TLE from a file. get_tle() and load_tle() create the satellite to track. s.begin_computing()             # Start calculating topocentric coordinates at 1 second intervals. Check AMSAT and CELESTRAK for satellite names. The TLE format SatTrack accepts can be seen in AO-85.tle. This functionality was added to allow antennas to track a satellite's pass using 2 servo motors. One servo motor controls azimuth and the other controls altitude. Servo control is split into 2 parts: getting coordinates for satellite, and conveying them to servo motors. Connect an arduino board via a USB port to the computer. Load the file ServoCont/multipleSerialServoControl/multipleSerialServoControl.ino onto the board. Quit the arduino IDE to free up USB port control. For most servo motors, you will not need to make any changes to the .ino file. Control (usually yellow) To protect arduino'c circuitry, connect the power supply wires to an external power source. Make sure that the ground connections are tied: both ground pins (on the arduino and the servo motors) are on the same node. Note: In case of empty/None parameters, default values in defaults.py are used. Output is stored as a .wav file. Class functions pertaining to servo motor control are still undergoing testing. For more details, see function definitions in the sourcecode.